I have to tell you he is kind of difficult to buy for when it comes to clothes. He is particular about his styles and typically keeps it casual wearing white or black t-shirts (unless it's hockey season then you have his favourite teams logo on most of what he wears) and jeans or black/grey sport pants. He doesn't dress up very often and he doesn't wear bright colours very often. He stays in the neutral zone despite my attempts to try to brighten up the wardrobe a bit. Speaking of bright, Fila Golf has some popping bright new colours to offer this season, for the wife like me who wants to see her man in something besides his every day! I was sent over a Fila Golf Men's California Polo in "Vanilla Ice" (I can't help but start singing "Ice, Ice, Baby! "), one of the bright new colours. I knew right when I saw it that it would be a shirt perfect for my hubby. Collar neck with four buttons, the sleeves are a little longer than traditional short-sleeve polo shirts. The material is super light and comfortable, the FILA sign discreetly on the left lower part of the sleeve. I know he will be very happy with this shirt on Father's Day! Button up or button down, Fila Golf Men's California Polo shirts are great for summer sport or casual and come in 8 great colours (black, navy, lake green, maize yellow, nirvana purple, vanilla ice, viva red and white). These super soft performance shirts are made from premium antibacterial fabric (86% Polyester and 14% Spandex) that features Fila tech-dry moisture management that helps your active Dad stay cool! 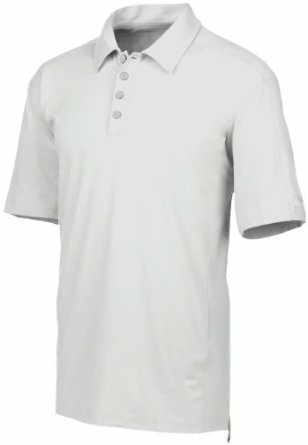 Fila Golf Men's California Polo shirts can be found online at the Fila Golf Shop and sport departments which sell Fila Golf apparel. Right now save 25% off shopping online at the FILA Golf Shop using coupon code "FILAFAN" *coupon code valid for one purchase* and get Free shipping on orders over $75 or more, see website for full details! Follow @FilaGolf on Twitter and Like ShopFilaGolf on Facebook for the latest updates! Disclosure: Posted by AME on behalf of FILA GOLF. Product was received for review purposes. Opinions and comments on this blog are those of the author. Wow, Fila`s line looks like the perfect Father`s Day gift. I know my husband can never have enough golf shirts etc. Thanks for sharing! for some more golf stuffs.